You can't beat plump, succulent fish, deep fried in a crisp, light beer batter, served with a generous portion of freshly cooked chips. It is one of Britain's favourite meals. For a real treat, make your own. You'll find it far lighter and more delicious than any bought alternative. Little preparation is needed before you start, but it helps to be organised. Have everything to hand in advance so that you are ready for last-minute cooking. Sift 125g flour with the salt, baking powder and turmeric into a mixing bowl and make a well in the centre. Pour half the beer into the well and whisk the beer, gradually incorporating the flour from around the bowl to make a thick batter. Whisk in the remaining beer. Cover and leave to stand for 1 hour in the fridge. Peel and cut the potatoes into 1.5cm thick slices then cut across each slice to make chunky chips. Put the chips in a bowl, pour in cold water to cover and leave until ready to cook. (You can prepare the potatoes several hours in advance.) Pat the fish dry with kitchen paper and cut into 4 chunky pieces. Season each piece on both sides. Cover and refrigerate until you are ready to cook. Heat the oil in the deep fat fryer or pan with basket to 180-190°C. While the oil is reaching temperature, thoroughly drain the potatoes and pat dry using plenty of kitchen paper. Add half the potatoes to the pan and fry for 10-12 minutes until golden and tender. When ready, drain the chips on kitchen paper then tip into a roasting tin. 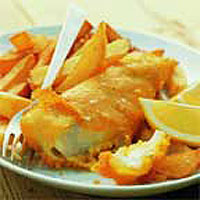 Keep the chips hot in a moderate oven while frying the second batch, and the fish. Remove the seasoned fish from the fridge and sprinkle with the remaining flour, turning them until they are coated in a fine dusting. Before you start to fry the fish, check the oil temperature. You will probably need to reduce the heat as the oil will get hotter once the chips are removed. Dip 2 pieces of fish in the batter until completely coated. Carefully lower the fish into the hot fat. Fry for about 4 minutes until crisp and golden. Drain on kitchen paper on a plate and keep warm while coating and frying the remaining pieces. Serve hot with the chips and lemon wedges. If you'd prefer not to use beer in the batter, use the same quantity of water instead. If using a pan fitted with a basket, pour in the oil until a generous third full and heat. Use a frying thermometer to check the temperature. As a guide, a 2-litre bottle of oil is the right quantity for a 24cm pan. If you do not have a deep fat fryer, use a large, heavy-based pan instead. Pour in the oil until about a third full and use a large, slotted spoon in place of the chip basket. Although helpful, a frying thermometer isn't essential. You can gauge the temperature by dropping 1 tsp batter into the hot oil. If it bubbles furiously and starts to brown in 30 seconds, the oil is ready. Never leave the kitchen while deep-fat frying. Once finished, leave the oil in the pan to cool completely. Use a funnel to pour the oil back into the bottle, discarding any residue in the base of the pan. Most fish-frying oils can be used a couple more times before discarding. You can cook your chips with their skins on: just don't peel the potatoes.